One of the great features of high yield bond fund is it provides high yield of income to investors. This high yield can be great incentive for investors who seek consistent income stream. 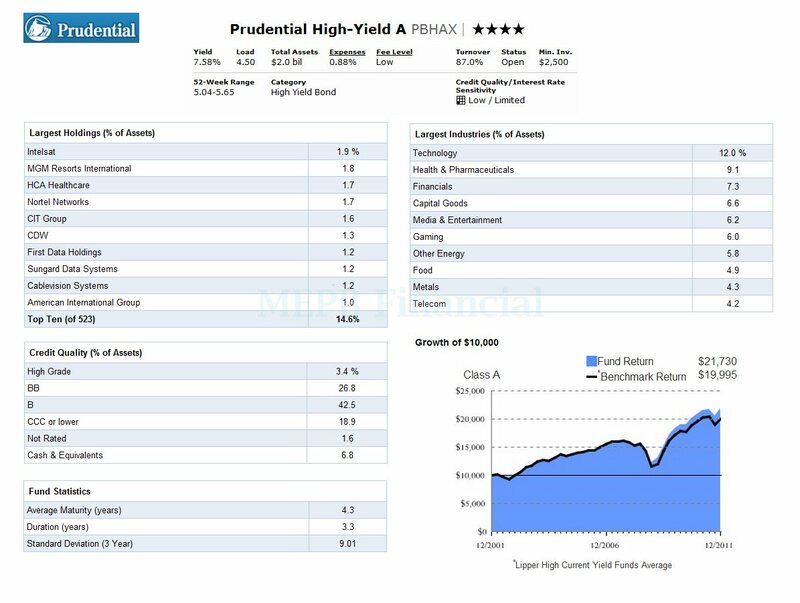 One of this top rated high yield bond funds is Prudential High-Yield fund. This fixed income fund has a yield of 7.61%. This dividend yield is paid monthly. More review about this fund can be found below. This Prudential High Yield fund invests mainly in a diversified portfolio of high-yield fixed-income securities rated Ba or lower by Moody’s or BB or lower by Standard & Poor’s. The fund management may also invest in bond with comparable quality (i.e. junk bonds). Paul Appleby is the fund’s lead manager since 1999. Other fund’s managers are Stephen Haeckel, Michael J. Collins, Terence Wheat, and Robert Spano. This fund was introduced to public on January 20th, 1990. The expense ratio of this PBHAX fund is 0.88%. This expense fee is a bit lower compared to the average in the category (1.14%). The 12b1 fee of this high yield bond fund is 0.30% and the front-end sales load fee is 4.50%. For investment risks, the risks include market risk, high yield risk, credit quality risk, interest rate risk, leverage risk, derivative risk, etc. To invest in this top rated high yield bond fund, you will need an initial investment of $2,500. The minimum subsequent investment is $100. And for IRA account or tax deferred account, the minimum initial investment is $1,000. You can buy this top high yield bond fund from 101 brokerages such as UBS Financial Services Inc, E Trade Financial, Fidelity FundsNetwork, Edward Jones, Morgan Stanley, etc. You can also invest in other classes of this fund such as Class B (PBHYX), Class C (PRHCX), Class Q (PHYQX), Class R (JDYRX), and Class Z (PHYZX). The PHYZX fund has a 5 stars rating. It also has the lowest expense fee which is 0.63%. As of January 2012, the fund has an average duration of 3.3 years. The top 10 bond holdings are Intelsat, MGM Resorts International, HCA Healthcare, Nortel Networks, CIT Group, CDW, First Data Holdings, Sungard Data Systems, Cablevision Systems, and American International Group. The top 10 largest industries such as Technology (12%), Health & Pharmaceuticals (9.1%), Financials (7.3%), Capital Goods, Media & Entertainment, Gaming, Other Energy, Food, Metals, and Telecom (4.3%).